2018 was an exceptionally active year in our community! We will begin our journey of summarizing the NVR&NA work done in Europe and Israel through 2018, in Tel - Aviv, Israel, where the 5th international conference was held. Our thanks to Sharon Ziv-Beiman, Dan Dolberger and Irit Schorr Sapir who organized this event, which gathered more than 250 participants. Still in Israel, at Schneider’s hospital, our team continued the tradition of “on stage dialogue” between the New Authority concept and other concepts in the field of youth care. This year we hosted Dr. Eia Asen from Anna Freud National Center in a conference titled ‘(New) Authority meets Mentalization’. The differences between the two theories were examined in a dialogue with Idan Amiel and a confrontation was almost unavoidable... You can have a glimpse of it in this short clip. A refreshing ending to the conference was given by Bart Colson from University hospital – UZ Brussels, who linked the New Authority and mentalization in his lecture – Vigilant Care in a mentalizing mind. A second day (in Hebrew) presented new professional developments of NA in Israel. Read here a short summary of our national conference. Moving to Europe, our NVR journey takes us to Austria. 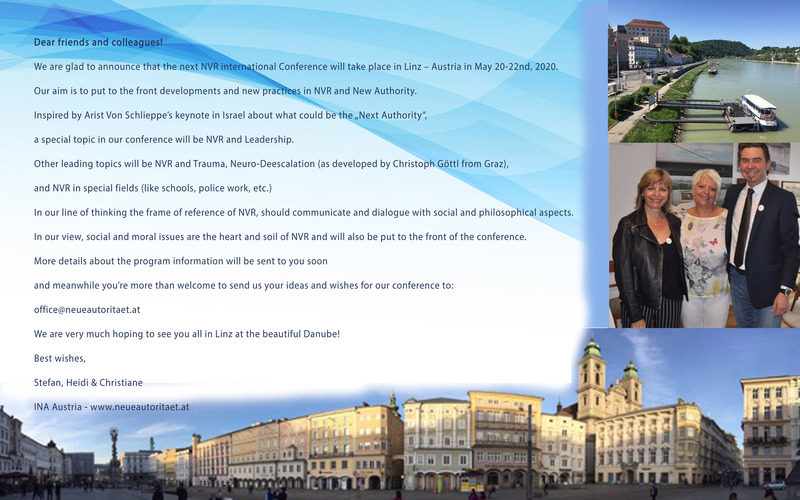 Attached here is the invitation for the 6th International NVR conference that will be held in Linz on May 20-22nd 2020. More information about the conference will be presented on the conference website soon. Meanwhile, just look at the lovely logo and title ‘From Fear to Trust to Cooperation’ and stay tuned for more. We send a ‘big hug’ from Israel to Stefan Ofner, Christiane and Heidi, wishing them success in their important mission for our community! The IKJF is continuing to combine successfully NVR with Positive Psychology. Read here Dr. Philip Streit’s report about the 10 tools they use while they implement NVR in Vienna, Graz, Stuttgart, Bregenz and more. Still in Austria, Martin Fellacher, director of PINA, continues to connect between NVR professionals and promoting the NVR concept. Together with INA and SPES, a program called “Couragierte Gemeinde” for municipalities was set. A cooperation with “Systemische Akademie Bramsche”, led to the first certificate course in Vorarlberg and two trainings on shame with Uri Weinblatt were held in October. Read here the summary of PINA’s activities. Crossing the border to Germany, side by side with our long-standing friends at IF-Weinheim, exciting developments are happening in Berlin. After a fruitful visit from Balagan’s team to Schneider hospital a new clinic in the vision and spirit of the Parents’ Counseling clinic in Israel will be established in Berlin! Read here about the professional process that lasted several years and led to this exciting development. Christoph Klein from Pfefferwerk Stadtkultur gGmbH in Berlin proved in October 2018 that crafting working networks is a traditional German practice. A conference titled 'Today’s support networks' hosted Eia Asen (from London), Justine van Lawick (from Haarlem) & Idan Amiel to demonstrate working with multi family groups, with social and professional networks. Read here more about the active and fruitful work done in Berlin with the New Authority concept. Other veteran organizations like SyNA and Systemische Akademie Bramsche continue their professional NVR work and demonstrate to us the sustainability of our NVR concept. In Switzerland, the 18th (!) annual 3-day conference “Stärke Statt Macht”, organised by isi, was attended by over 300 participants, and hosted Haim Omer, Eia Asen and Uri Weinblatt, as well as Arist von Schlippe and Stefan Ofner. A moving part of the conference were the families who shared their experiences with NVR. The experts of isi.netz24 are accompanying many institutions in long-term projects and in the German speaking part of Switzerland, the New Authority has become an important reference for a pedagogical approach. Read more about the impressive work done by Claudia Seefeldt from isi and new workshops on shame done by Dr. Uri Weinblatt. Combining sustainability with creativity in using the New Authority concept is wonderfully demonstrated in the Netherlands. Starting with the work of Eliane Wiebenga and Hans Bom from Lorentzhuis, the concept of Connecting Authority (CA) is gathering more support. A successful and productive conference in 2017, titled 'Connecting authority based on principles of nonviolent resistance' paved the way to assimilating CA in the Netherlands. In essence, CA combines NVR with Attachment theory, Read here more about Connecting Authority or go to our resources section where several articles about the subject are presented. An interesting effort to implement CA was leaded by Ziv Gilad from Israel in a workshop for Police Academy. Another creative way to implement NA is a brand-new program initiated in the Netherlands by Rubicon Jeugdzorg (in cooperation with Bijzonder Jeugdwerk) called “Back on Track”. In this program, parents begin with a group training in New Authority & NVR, and then, together with their child leave for an “outward bound” long weekend in the Belgian Ardennes. There they will participate, as a family unit, in exercises in experiential learning about their relationships. Wil van Nus is proud to let us know that her book Geweldloos verzet op school (NVR in school) has sold out and a second revised edition will soon be published. But not only in schools and with parents, NA also spreads in closed residential care. Before crossing the border to Belgium, we can listen here to a radio documentary called Het Thuisfront (Home Front) directed by Marije Schuurman Hess. Marije who followed an NVR training as a mother, interviews parents who followed the program in DeBascule, side by side with NVR professionals (Wim Braamse, Idan Amiel and more). Her inspiring podcast was also broadcast on the Dutch national radio. In Belgium we will raise a glass (preferably with a Belgian beer!) to the first university certificate NVR/NA-training! The training program lasts 10-day in Brussel University (Vrije Universiteit Brussel) and is organized by BIGV. Read here more about the variety and intensity of BIGV activities over the years as was send to us by Frank Van Holen. Interactie-Academie Antwerpen, led by Willem Beckers, continues to carry out trainings together with Peter Jakob from Partnershipprojects. Willem is also providing workshops on his work in the context of NVR and adult child dependency, supervised by Dan Dolberger. Additionally, Annelies Huybrechts and Kerstin Thys, promote the use of NVR in the context of unaccompanied minor refugees, through workshops and trainings. The Solution Focused Center in Belgium founded by Chris Van Dam and Sven Bussens is combining Solution-Focused Coaching and Leadership with the New Authority concept. An advanced workshop with Idan Amiel and Sven Bussens will focus on the similarities and differences in the mindset of New Authority Vs. the Solution-Focused model. The active work of Sven Bussens in co-operation with Expoo, Vcok and Hogent, led to the development of a treatment model in the context of preventive family support. The model combines the New Authority with the Solution Focus approach in daily parenting and a book titled – ‘Vigilant Caretaking for Teenagers’ has been just published. Promoting NVR via books and research leads us to Ireland where Declan Coogan continues his practice, training and research on Non-Violent Resistance and Child to Parent Violence and Abuse. Read about his new book titled - Child to Parent Violence & Abuse – Family Interventions with Non-Violent Resistance. The book steps into the gap left by a lack of easily available and adaptable intervention programs in English and leads us to end our tour in England, where a new comprehensive NVR book will soon be published. Unlike the political situation of the Brexit it looks like our British NVR activists in UK are acting together. Just read here about the work and activities done over the years by NVR UK members. Lastly, in a new NVR handbook titled ’Non-Violent Resistance Innovations in Practice’ the editors - Elisabeth Heismann, Julia Jude and Elizabeth Day gathered almost 20 NVR professionals to describe their NVR work and innovations. Read a book review on this ambitious and comprehensive NVR handbook or just continue your tour to the resources section in the newsletter and enjoy our summery of new books and articles published by our community’s professionals. Wish to publish your events for 2019?